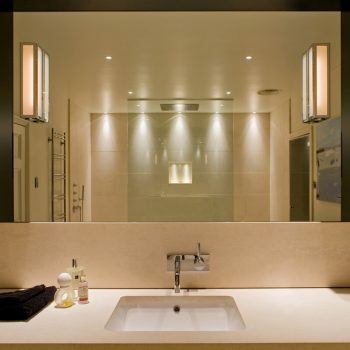 Good bathroom lighting can change the look and feel of a bathroom at the flick of a switch. 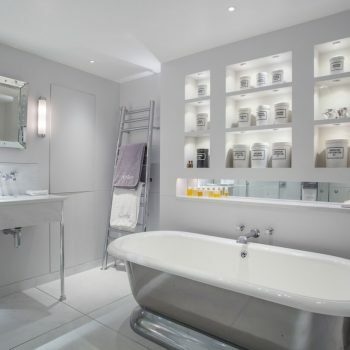 Here we will give you some top bathroom lighting tips and ideas to ensure you make the most of your bathroom with great interior lighting. First you will need to assess your bathroom lighting needs: Think about when you use the bathroom and how much natural daylight is there? 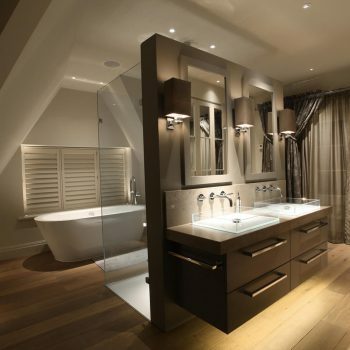 Do you want mood bathroom lighting? Which features do you want to enhance, and where will you need task lighting to see really clearly? 1.General lighting – Downlights are a practical consideration for general light, but forget the concept of a grid of lighting. Instead highlight the finishes by locating the LED Waterspring close to the tiled or stone wall, providing streaks of light almost like running water. Position another to direct towards the basin and another above the WC or towel rail will provide the perfect balance. If you are unsure of the IP Zones in a bathroom, take a look at our handy guide: Bathroom IP Rating and Zones. 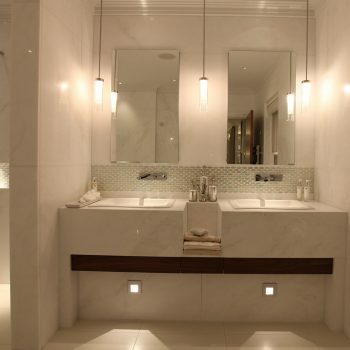 2.Task lighting – This relates to lighting around the mirror. Without doubt the best solution is two wall lights either side of the mirror as this gives the correct side light that will balance the face. Pendants such as the Grissini or Penne are an ideal solution. 3.Spa magic – For the magic and spa quality, using one watt low level LEDs make all the difference. 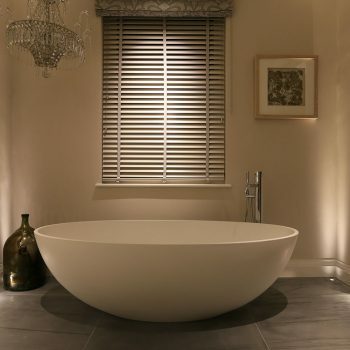 Consider Lucca uplights when lighting a stone or tiled wall behind a freestanding bath or set into a windowsill to light shutters. This effect is almost like putting nightlights around – it is the instant candle. Combine these with floor washes under the sink on the side wall to wash the floor using the Sirolo or Cazalla reflects the light off the floor and creates another layer! 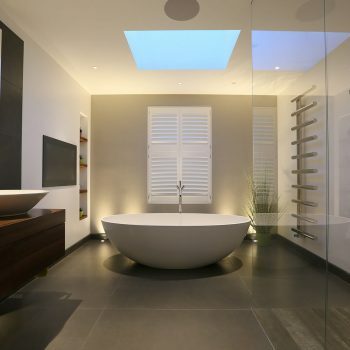 4.Additional impact – Why not add another layer of lighting with the addition of lit niches either in the shower or above the bath. These can be lit with a Contour HD27 LED strip or Etta Eyelid under cupboard light as shown here in this display unit. 5.Night light – Consider the addition of low level lighting which comes on with a PIR which can be used at night. Sirolo or Cazalla make great night lights or place a Contour LED strip under a floating basin. 6.Lighting control – To create the perfect balance to the layers of light dimming control is essential. For a simpler effect consider two dimmed circuits one for the general light and one for the task mirror light and the lower level effect light. A perfect solution is to use a control system as this will give you four scenes and off.